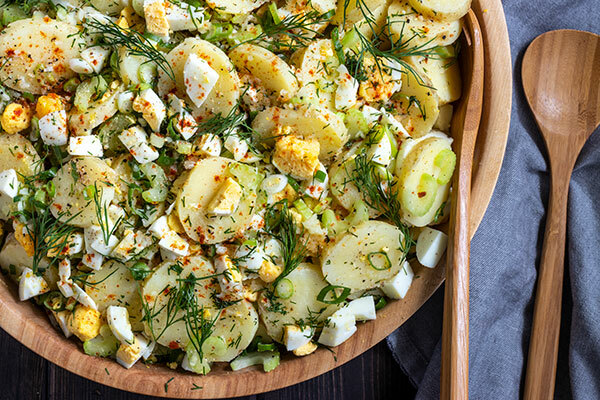 You won’t even miss the mayo in this no mayo potato salad recipe. Instead the dressing is a very flavorful blend of spices and oil instead of mayo. 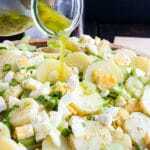 Its a little lighter and the ingredients of the salad really shine through. What goes into a no mayo potato salad dressing? 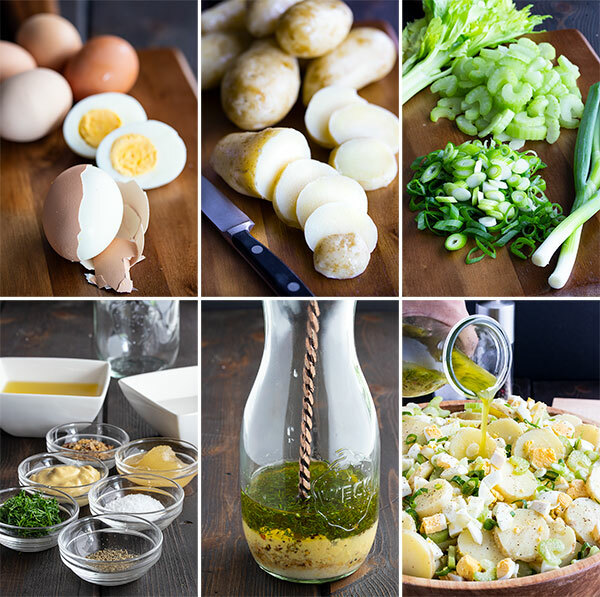 Basically this potato salad recipe is made with a vinaigrette instead of a creamy dressing. 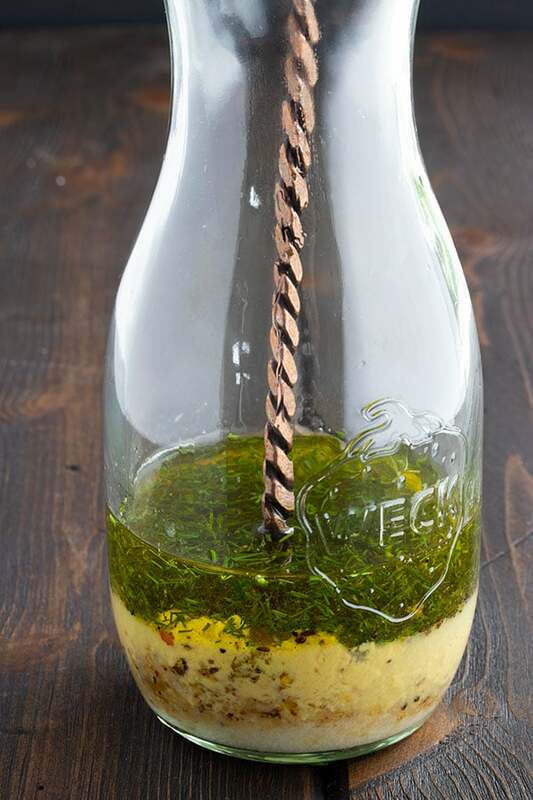 The base is an oil and then its flavored with mustard, salt, dill, garlic, vinegar and honey. The type of oil you choose for your dressing matters. 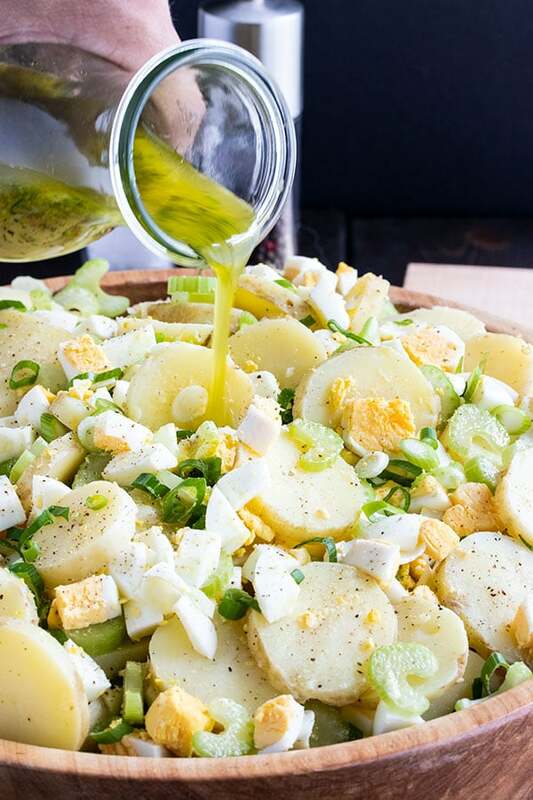 These are our favorite oils for making this no mayo potato salad with as well as a vinaigrette for any other salad for that matter. MCT Oil – we love this for it’s health benefits, but it also doesn’t have a lot of flavor so the rest of the ingredients shine through. Avocado Oil – another great option and this one also has a high smoke point making it great for cooking too! What the best potato for potato salad? How to best cook the potatoes for potato salad? You want to boil your potatoes for this potato salad. Roasting them could make them fluffier inside and then they would just fall apart when you cut them and the skin could get quite tough. Think baked potato. Not the right textures you want in your potato salad! So boil them, but boil them with the skin on so they don’t fall apart. Then let them cool completely before you cut them into chunks or slices for your salad. This potato salad has a LOT of eggs in it. Hard boiled eggs. Have you ever made hard boiled eggs and then when you take the shells off and slice them open, the yolk has that ugly dark greyish layer around it? That just drives me to drink! A while back I found a simple way to stop this from happening. You put your eggs in a pot, cover them with water, then put the pot on high heat until it boils. Once it boils, cover and remove from the heat. Keep the lid on for 15 mins, then drain and cover with cold water. Follow these steps and you will get perfect hard boiled eggs every time! You know, we have never tried and to be honest, we probably never will. Unless we have way too much left overs and they wont get eaten. There’s nothing wrong with freezing them, I don’t think, however I am willing to bet that it will not have the same texture and it could be soggy. Can potato salad be made ahead of time? Absolutely! You can make this salad anywhere from an hour ahead to a day or maybe even two days ahead of time. Just make sure to keep it covered and in the fridge. 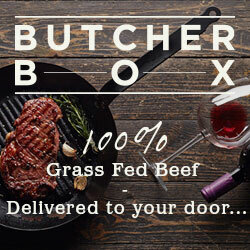 Take it out of the fridge 30 mins to an hour before you serve it. 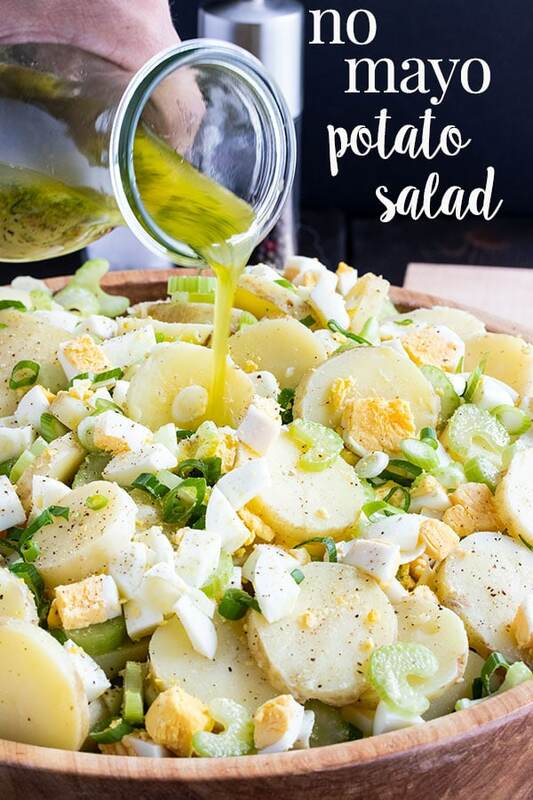 If you’ve tried this no mayo potato salad recipe then don’t forget to rate the recipe and let us know how it turned out in the comments below. We love hearing from you! 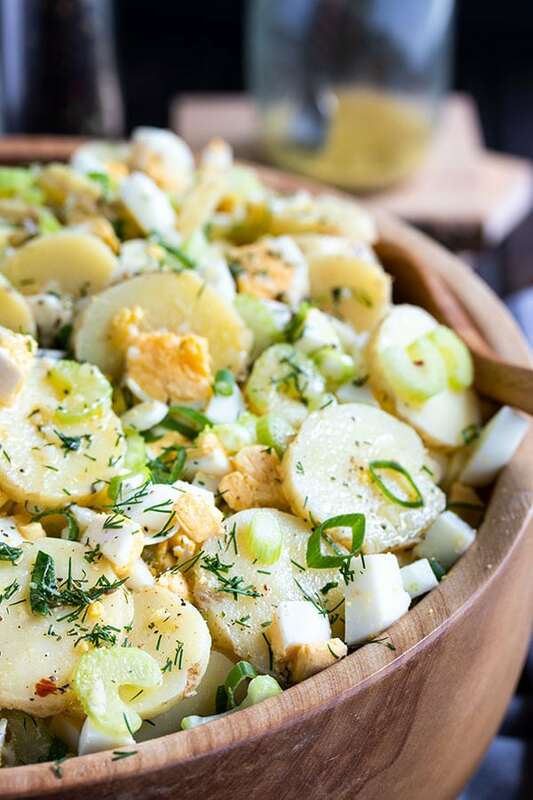 You won't even miss the mayo in this no mayo potato salad recipe. Instead the dressing is a very flavorful blend of spices and oil instead of mayo. Its a little lighter and the ingredients of the salad really shine through. Put your potatoes in a pot and fill with salted water. Heat to a boil. 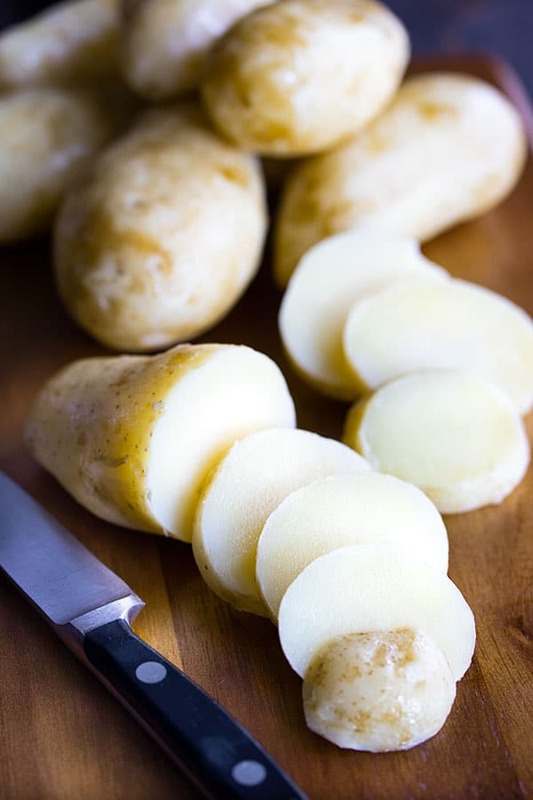 Once its boiling, reduce heat to medium and cook till potatoes are fork tender. Remove from heat, drain and cover with cold water to stop the cooking process. Drain all the water off again and set aside. Put your eggs into a pot, cover them with water, then put the pot on high heat until it boils. Once it boils, cover and remove from the heat. Keep the lid on for 15 mins, then drain and cover with cold water. Drain again, peel and slice the eggs and add them to a large bowl. Add the chopped celery, green onions and dill. Chop the potatoes in bite sized pieces and add to the bowl. Sprinkle all ingredients with Montreal steak spice. Mix the ingredients for the dressing, shake or whisk well and pour over top of the salad. Mix well and serve.